The Alaska Department of Transportation & Public Facilities (DOT&PF), in cooperation with the Alaska Division of the Federal Highway Administration (FHWA), proposes to reconstruct 35 miles of the Dalton Highway. 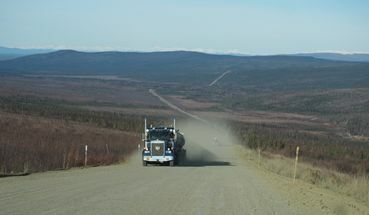 The 415 mile long Dalton Highway is a vital link in Alaska’s transportation network. Initially constructed as a haul road for the development of Prudhoe Bay oilfields, the roadway does not meet current design standards. Reconstruction of the Dalton Highway between Mile Post (MP) 109 to MP 144 will address critical segments of the highway. The project will also address issues such as narrow roadway, lack of shoulders, thawing permafrost and drainage issues. Improvements will reduce state funded maintenance costs and prolong the service life of the road. Click on image for project area map. * All curves and grades will be evaluated. Some may require design exceptions/waivers if meeting the standard is not practical or cost effective for the Dalton Highway. The project is currently in the preliminary design and environmental phase. Fieldwork is on-going this summer (2018) to identify environmental baseline conditions and assess the current roadway issues. Construction for the project may be broken into three phases, and is anticipated to begin in 2021.